This issue of Clinics in Laboratory Medicine, edited by Drs. 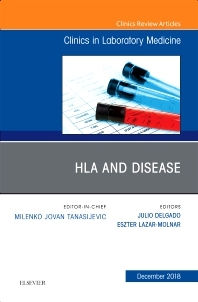 Julio Delgado and Eszter Lazar-Molnar, will focus on HLA and Disease. Topics include, but are not limited to, The potential impact of NGS in HLA and disease association studies, HLA typing by NGS, HLA Antibody Testing: Evolution and Challenges, Diversity of killer cell immunoglobulin-like receptors and disease, Technical Aspects of Crossmatching in Transplantation, HLA Markers in Celiac Disease, HLA Associations in Drug Hypersensitivity Reactions, HLA in BMT, Post-transplant monitoring, HLA epitope matching in transplantation, and Molecular Testing in Post-Transplant Monitoring.